Trio Rock 'n' Roll US formé en 1964 à Brooklyn (New York) et composé de Bob Feldman, Jerry Goldstein, Richard Gottehrer. 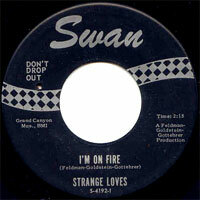 Les Strange Loves se sont séparés en 1968. 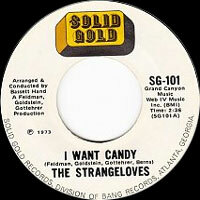 While the Strange Loves managed to produce one garage band classic, their story is probably more interesting than their actual music. Bob Feldman, Jerry Goldstein, and Richard Gottehrer were a trio of Brooklyn songwriter/producers who landed a number one girl group hit with the Angels' "My Boyfriend's Back." When the British Invasion crested in the mid-'60s, they decided to get in on the act by recording as a group, billing themselves as an Australian outfit to cash in on the mystique being attached to foreign groups. 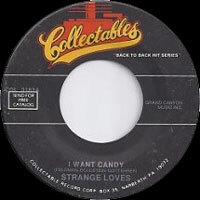 "I Want Candy," with its crunching Bo Diddley beat, joyous chorus, and rambling lead guitar, was their great moment, reaching number 11 in 1965. Forced to put together a live act to support their disc, they made outrageous claims to hail from the nonexistent town of Armstrong, Australia, where they had made a fortune as sheepherders who had developed a cross-breed. 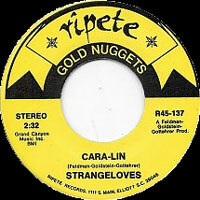 They also made the Top 40 with a couple fairly gutsy follow-ups, "Cara-Lin" and "Night Time," both of which were built around crunching claps, stomps, and drums. 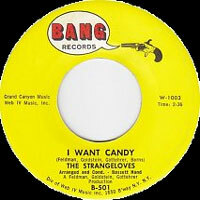 Also recording an album and several non-hit singles, most of their material unashamedly plagiarized the Bo Diddley beats of "I Want Candy," with forgettable results. 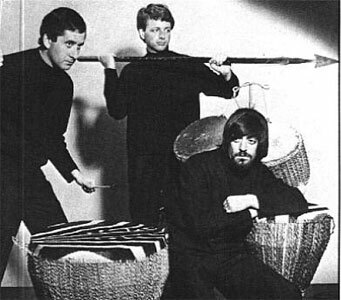 They withdrew from performing and recording to concentrate on writing and producing for the McCoys, although Strangeloves releases continued to appear until 1968. Goldstein went on to produce records for War in the 1970s, and Gottehrer produced efforts by Blondie, the Go-Go's, and others. 08/1964 SP SWAN S-4192 (US) . 05/1965 SP BANG B-501 (US) . 09/1965 SP BANG B-508 (US) . 12/1965 SP BANG B-514 (US) . 05/1966 SP BANG B-524 (US) . 04/1967 SP BANG B-544 (US) . 10/1968 SP SIRE 45-4102 (US) . 10/1970 SP SIRE 45-4120 (US) . 1973 SP Solid Gold SG-101 (US) .